On one hand, I found Flash #11 — chapter 3 of “The Road to Flashpoint” — to be a lot more engaging than the previous issue. On the other, it highlights some problems with the series. I was disappointed to see that Francis Manapul didn’t draw this issue, though seeing Scott Kolins’ name was a relief. That said, while I normally like Kolins’ art on The Flash, it actually looks rushed, especially on the early pages. I have to wonder how much time DC gave him to draw the issue. The pacing, however, is much better than the previous two issues. After an issue-long teaser and another issue that was 50% exposition, we actually get into the meat of the story here — a story very much about Barry Allen, the man who works as a police scientist, not the Flash who happens to be Barry Allen (which may be part of why I liked it better than #10). 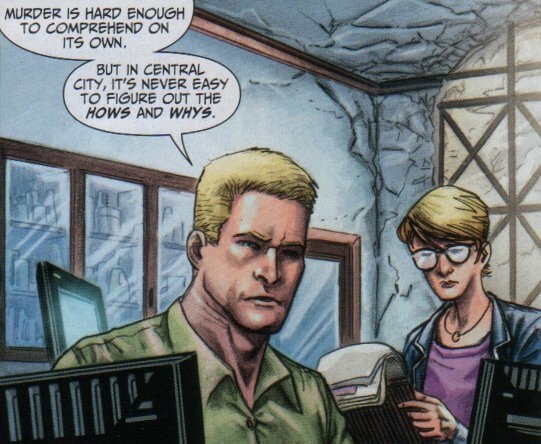 Geoff Johns does a good job of keeping Hot Pursuit’s motivation and methods ambiguous throughout the issue, keeping it unclear whether he’s causing or tracking the murders. The super-heroics kick into gear at the very end, with not one but two cliffhangers to be resolved in next month’s series finale…though with a title like “The Road to Flashpoint,” it seems pretty clear that it’ll wrap with some sort of transition. I expect the “last issue” to end in one of two ways: Either it will feature a teaser with Barry in the altered reality of Flashpoint, or it will end with a fade to white like all of DC’s “Zero Hour” tie-ins back in 1994. The intervention sequence is the payoff for all the little things that haven’t been quite right about Barry and his relationships with his extended family since he came back. I found myself really wanting to see what we’ve been missing with Bart that’s brought him to the point that he doesn’t even want to deal with his grandfather anymore. Bart’s usually the picture of happy-go-lucky, but when he gets depressed, he gets really depressed. That said, I would have liked to see Jay and Wally do something other than gush about how great Barry is. So, Hot Pursuit believes Bart’s presence to be the source of the Flashpoint time anomaly. Either he’s not as meticulous in his research as he claims, or he’s just feeling way too rushed to realize that Bart’s been in this time period for years. My guess: Whatever Hot Pursuit does to send Bart back ends up creating an anomaly that the Reverse Flash can use. Speaking of the Reverse-Flash…Geoff Johns is really making a habit of bringing in the Reverse Flash in the second half of a story as a surprise villain. “Rogue War,” “Flash: Rebirth,” and now “The Road to Flashpoint.” In this case the manner of his return made very little sense as well (He transformed himself into a child so that he could develop his powers? Huh?) — though I’m sure we’ll get another couple of pages of exposition next month. …and I can’t shake the feeling that this backstory has been added solely so Zoom can kill someone important to Barry without killing off a member of the current cast. 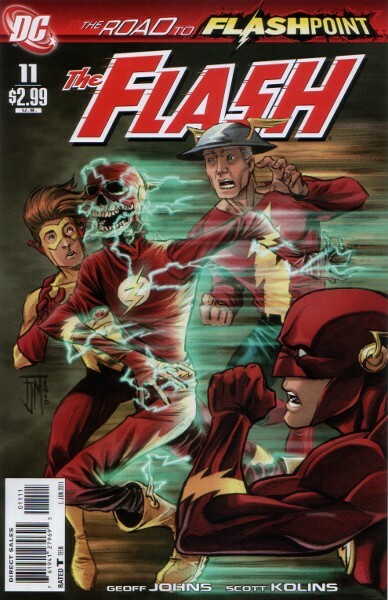 It’s always a cheap shot to bring back a long-disused character just to kill them, but it’s happened with three Flash villains (Savitar, Christina and the Black Flash in Flash: Rebirth) and a trio of supporting characters (the Three Dimwits in Justice League: Cry for Justice) in just the last two years. One last thing: The return of the letters column. It’s nice to have a permanent record of at least some of the fan response. I’ve seen message boards lose or purge older posts, I’ve seen blogs lose their old posts in database crashes, and websites just shut down all the time…but a letters column lasts as long as your copy of the book does. (It’s also more interesting than tossing in the same editorial article that’s in every other DC book the same week.) Even so, it still feels unnecessary. I had to remind myself to read it…which was fortunate, because I saw the first confirmation that Abra Kadabra will appear in Flashpoint. This entry was posted in Reviews and tagged Barry Allen, Bart Allen, Francis Manapul, Geoff Johns, Hot Pursuit, Road to Flashpoint, Scott Kolins, Wally West on April 29, 2011 by Kelson. With other writers of Wally I always assumed they wrote what they felt Wally would say. With Geoff Johns I feel that he is not writing what Wally would say….but what he wants Wally to say regardless of anything else. This is why I have lost a lot of respect for Geoff Johns as far as the Flash book is concerned and bothered to find out how to change my Comic Block name from the generic Geoffan to something else. Hell, I’m reminded of that DCAU episode Flash & Substance where Orion bumped into the Flash standee and it spouted a line: now we have a Wally standee in the Flash books spouting short cheerleader phrases about Barry. I’m glad I’m not the only one who was confused by the whole Revers-Flash stealing age thing…that made absolutely no sense to me. I figure that how Reverse-Flash de-aged and then re-aged himself while stealing peoples’ life energies will be explained next issue, so I’m not too concerned about it not making any sense yet. Speaking of characters from Barry’s past, I’m really hoping Geoff brings Fiona Webb back in some capacity during Flashpoint. Since she was such a pivotal character towards the end of Barry’s previous run of The Flash I’m hoping Geoff is just saving her for something bigger than why he brought back Patty Spivot. I think you’re right about why DC brought Patty back. She’s like one of the Red Uniforms from the old Star Trek (or maybe if I were to be more generous, she’s like the Tasha Yar of The Flash). Just found out about the latest IGN interview with Geoff Who? and am ticked. Besides the obvious that that Geoff Who? considers Wally West to be an Unmentionable Best Forgotten, has anyone else noticed that Emperor Aquaman (Aquaman, the next big thing for Geoff) looks a heck of a lot like a certain crew-cut speedster? He’s even wearing a certain color. What next…Superman goes blonde and says hello to a buzz razor? Wonder Woman with yellow boots? Yes, I’m really ticked off right now. Seems to be a recurring theme for me ever since Rebirth ended. Patty better not get killed off. I think Thawne having age-changing powers is pretty dumb, but then a lot of the speedsters seem to develop weird abilities that don’t make any sense. In general it makes them excessively over-powered, and one wonders why any non-speedster is a threat to them at all. I think that the idea is to develop new applications for speed. I guess that Zoom’s ability to make himself younger or older by stealing other people’s life force might be related to the youth treatment that Iris received when Barry came back. It was a much more entertaining issue, compared to almost all the previous ones. I’ve never been excited about flashpoint, but I’ll keep my fingers crossed. If the Red Lanterns got a book out of the success of Hal’s book, I’m sure Wally will get one if The Flash becomes as successful as GL. Alright, sounds better that both previous issues! The whole issue seemed rushed to me, weird-looking figures spouting unfeasibly cheesy dialogue. I think someone else mentioned, it just makes you think what the original plan was if the schedule was kept to; more development, more time, more space to breath rather than pulling out plot threads from all over the place just to tie into the latest mega-event.